Air India Customer Service – Hello everyone welcome to Aviation Dreamer. This is the most waiting article for all the Aviation Lover or Air India Job lover. So, today I am gonna write on Air India Customer Service position of Ground Staff. Today’s topic is – Air India Customer Service Officer Job in Bangalore. Without skip, any single sentence read it fully to know each and everything about this job. Coordinate and interact with various government agencies (ATC, AAI, DGCA, BCAS etc.) in order to ensure smooth flight operations (Pre/Post-flight). Ensure safe and secure operations and flight departure on or before schedule time in coordination with the respective flight supervisors. Establish counter management, queue management, and proper boarding guidelines. Coordinate crew movement as per the airline specifications. Handle staff grievances and complaints and other administrative issues which need not be escalated. Arrange and ensure transportation of crew and staff, where applicable. Monitor the flight operations including pre-flight, arrivals, and departure and post-flight activities. Conduct briefing in advance of the day’s operations and solutions to the problems faced by the staff periodically. Handle staff grievances and complaints within a reasonable time span and escalate to Duty Manager wherever required. Handle multiple tasks to maintain optimum work output. Assist and guide team/staff when facing difficulty in handling passengers. Process standby passengers, interline passengers, upgrading and passengers require special handling. Conduct pre-flight briefing and ensure that his subordinates are conversant with the standing regulations and procedures. Ensure that each passenger is handled according to precision timing and procedures as per airlines standards. Assist and guide Customer service agent I and agent II facing difficulty in handling passengers. Ensure FHR is properly filled and timely signed by the respective airline representative. Coordinate the activities of the airport operations as far as flight handling is concerned and extend proper communication to staff periodically. Minimum 24 months of experience in the relevant field. Should be able to handle different situation. You Should have good command over computer application personal characteristics and behaviors. Possesses openness to new challenges. Allows being ready to take challenges and meet the deadlines. Should have the ability to solve problems. Requested to all the Interested candidates to send their resumes with 2 passport size photograph( white background) on the below-mentioned address of Air India Sats. Also, you can apply for online buy fillup an online form and you should attach your updated resume. Check out the details in the below option. 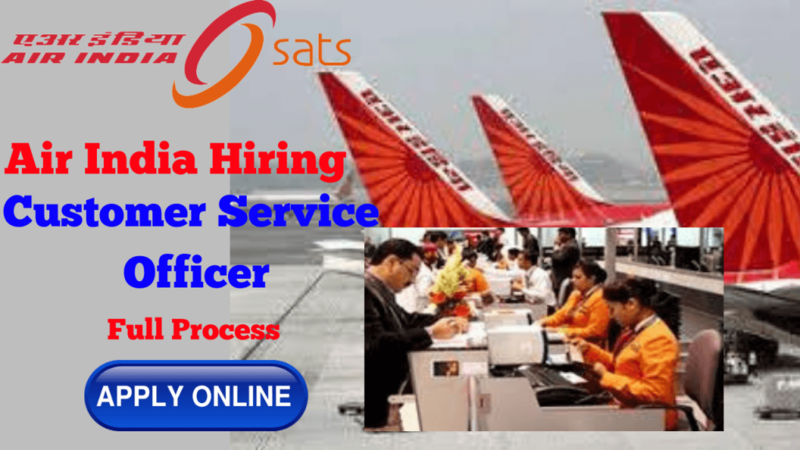 Click Here to apply Air India Customer Service Officer Online from their official website. Click Here to check the same information from AISATS official website. Thank you for being with Aviation Dreamer. If you have any more query related to this post or related to Aviation Industry you can feel free to comment on the below. Also, you can contact me on my Facebook Page and YouTube Channel. Thank You. My name is Sanjay Vishwakarma. I am searching online job and upload resume. I have received a request from someone he is call me for telecalling interview and I done this and I selected. He took 1600 rupees from me for the documents verification charge. Now he is speaking that you have 3 months of training. Air Asia Resort book for training. It costs millions for food and training to meet the cost of food. Therefore, before training 12500 of all are demanding.